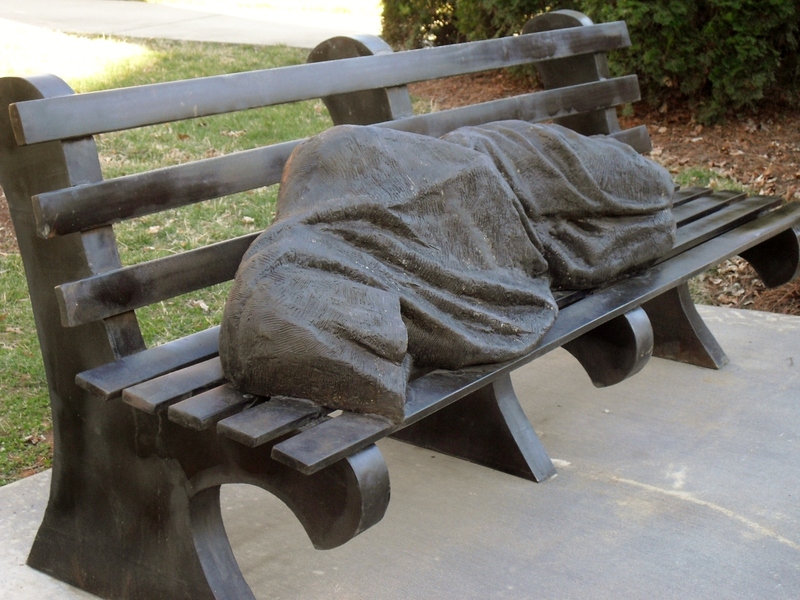 “Homeless Jesus”: Is it Art and What does it Mean? THE CONTROVERSY SURROUNDING THE INSTALLATION OF A NEW ART PIECE in the lakeside town of Davidson, is creating quite a stir that has grabbed attention in the national and international news. I’m reminded of the saying, “Art is in the eye of the beholder.” I don’t know who said this first, but it has the ring of an eternal truth. 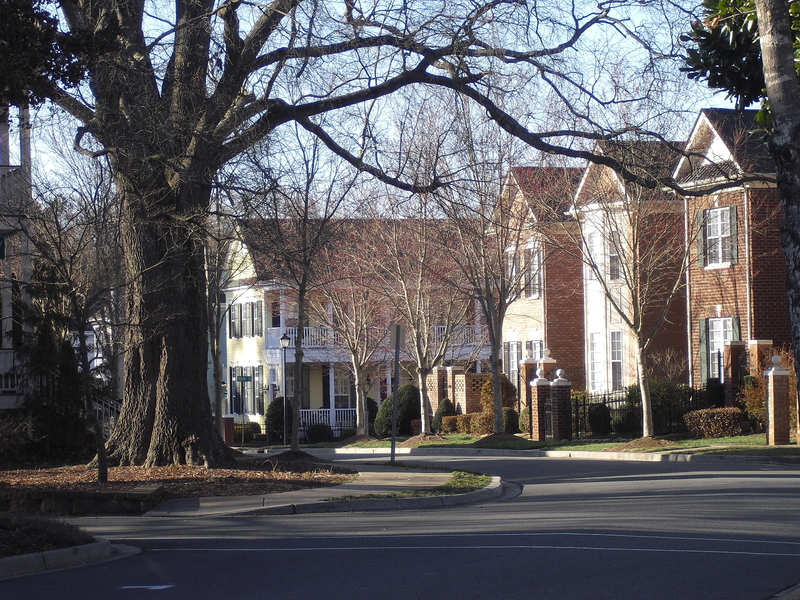 DAVIDSON IS A COLLEGE TOWN, home of Davidson College, and situated on Lake Norman, 20 minutes North of Charlotte, North Carolina. Davidson has been described as reminiscent of the small town America of Rockwell paintings, with tree lined streets and well kept homes with sidewalks, bike paths and green spaces, and a main street with places to park in front of stores and restaurants… Toast, the Soda Shop, antique shops, and more. WE MOVED TO a rented townhome in Davidson a few weeks ago, after we sold our home in Charlotte, while we look for our new home as “empty nesters”. I was interested in seeing the Homeless Jesus sculpture for myself that was causing such different reactions. 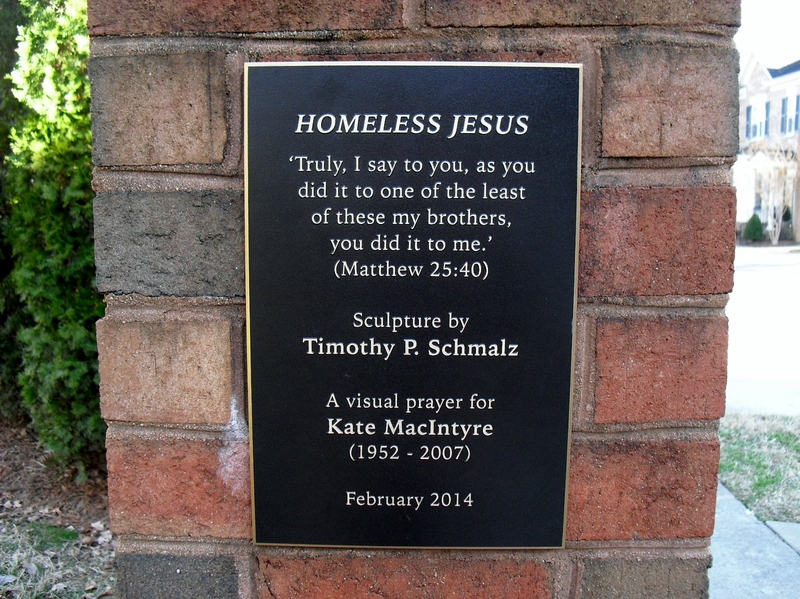 The Homeless Jesus Sculpture was the creation of Timothy P. Schmalz, a Canadian sculpter. His larger-than-life sculptures are displayed in various places in the world. He has created bronze sculptures honoring military families, firefighters and a memorial to the 911 tragedy. One statue stands in front of the Santo Spirito Hospital in Rome. He is working on a 100 foot sculpture of St. Patrick to be given as a gift to Ireland from North America. The details and stories depicted in his sculptures are riveting, and it’s hard to look away. I HAD NO TROUBLE finding St. Albans Episcopal Church, where the sculpture was on display, as it was only a few blocks away. 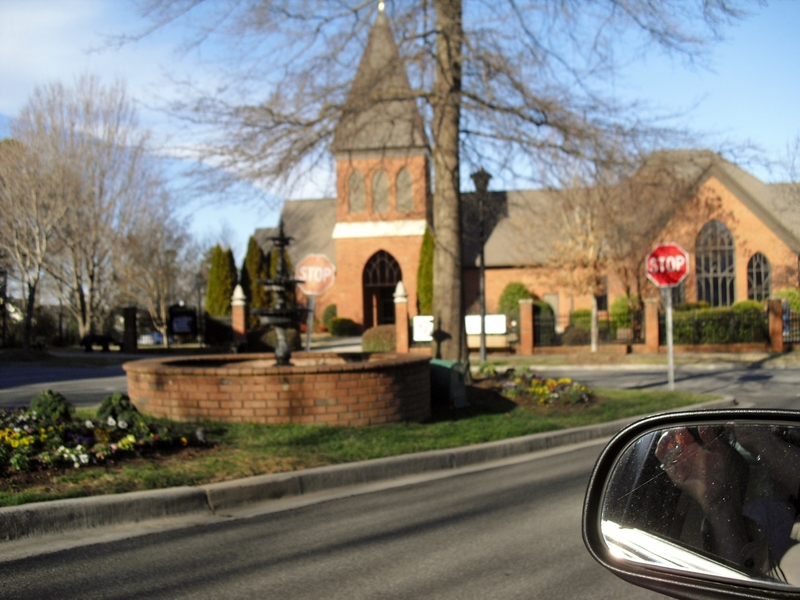 The stately church is located in a quiet area of town tucked into landscape in the midst of tree-lined streets and well-kept townhomes and single family homes with sidewalks. 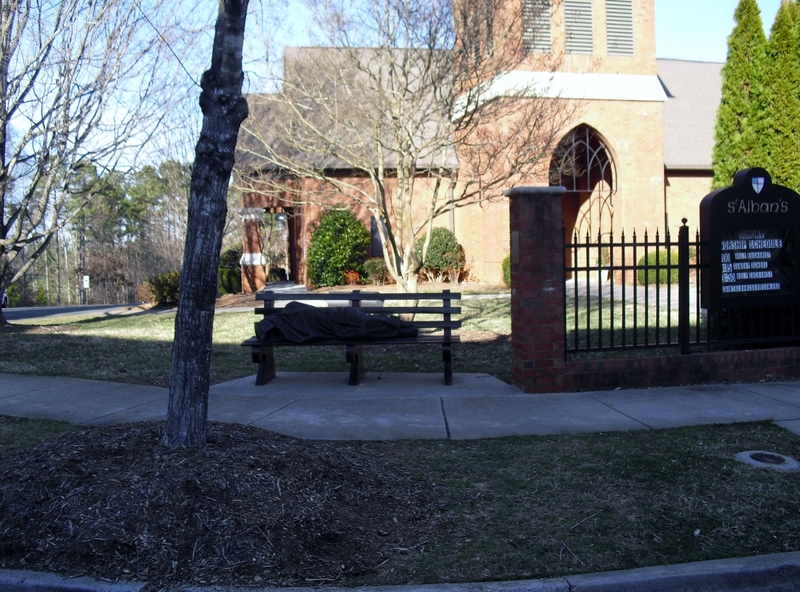 AS I APPROACHED, I saw several park benches at the edge of the church’s property beside the sidewalk, beckoning walkers to sit and rest. I PARKED THE CAR AT THE CURB and walked to the park bench with the now visible reclining sculpture. The feet clearly showed the nail holes, signaling that this creation of bronze was meant to be a depiction of a sleeping Jesus. Some of the naysayers disliking the sculpture said it should be in a private garden, or at least placed away from the front of the church. 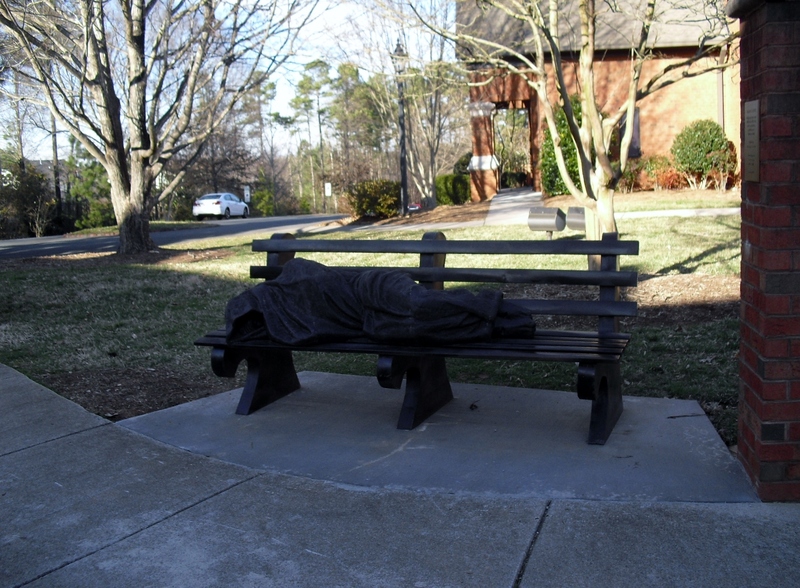 One neighbor interviewed on TV commented that “Jesus was not homeless,”, and said it was not appropriate to represent him that way. Some neighbors consider the sculpture to be sacrilegious. 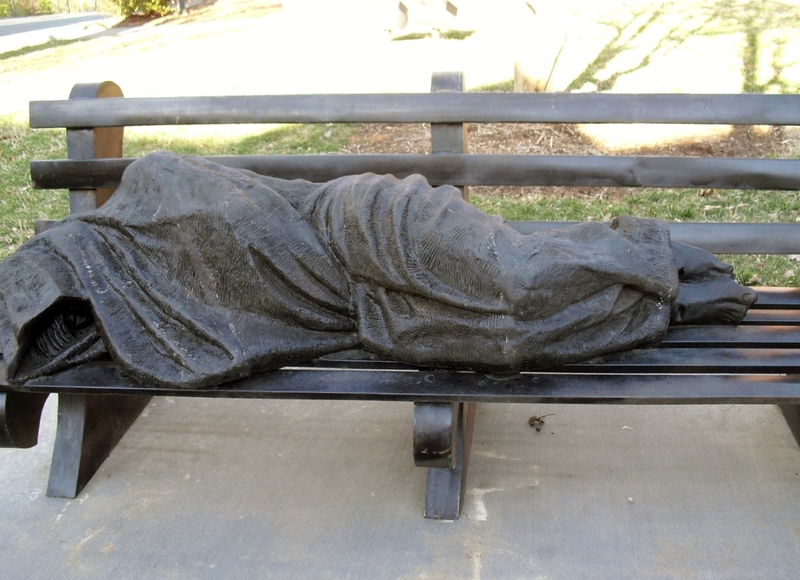 Some appreciate the beauty and skill of the bronze sculpture of the Homeless Jesus, focusing on the workmanship. Others are forcefully reminded of the story and societal mandate to give back to others in need. Still others sit at the end of the bench and pray, laying their right hand gently on the bronze leg of the sleeping Jesus statue. My own thinking is that we need art to expand our humanity, as much as we need science to expand our knowledge. Art can tell us a story, stir our emotions and challenge our thoughts. If art can do this, maybe it will make us think about what we really do feel and believe…(no matter our differences in ethnicity, geography or spiritual beliefs), as well as what contributions we can make to each other…and to the world. MAYBE. It is definitely art. Seeing this, I imagined the same piece, only on the ground, with the head nestled in the lap of an additional piece– one of Mother Teresa. Thanx for the post. Peace. I can see it. Thanks for sharing your vision. The real tragedy is if no one said anything once the work was installed. As it is, this piece is doing exactly what art does: it makes people think. You are so right, John! Thank you for sharing this wonderful sculpture with us, It is truly magnificent. I felt any number of emotions shift through my body as I read your blog and any time emotions are moved, I believe it is a good thing. The sculpture immediately brought to mind the thousands of veterans living on the streets of our country and over 70% of them are now over 60 years old. The statistics for homeless women continue to rise at an alarming rate. 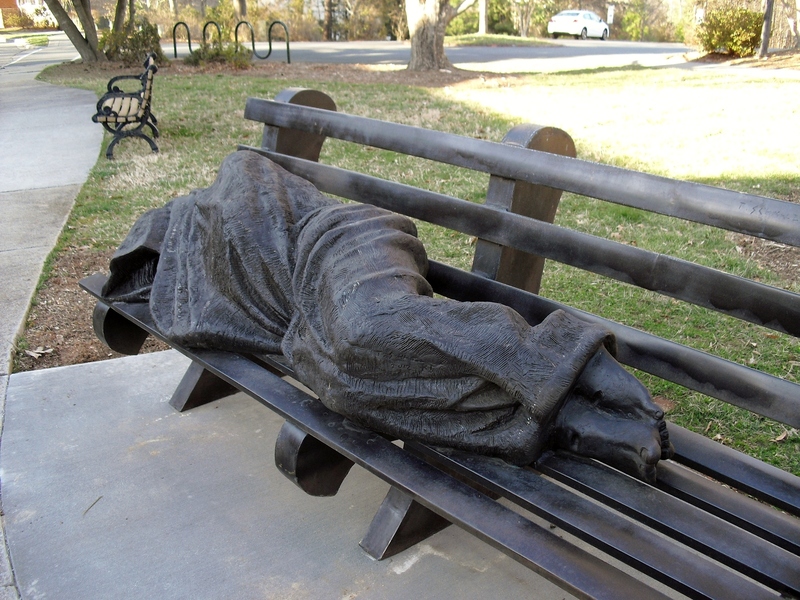 My thought, if the statute of Jesus sleeping on a park bench causes people to talk, then we have a very good thing going here. 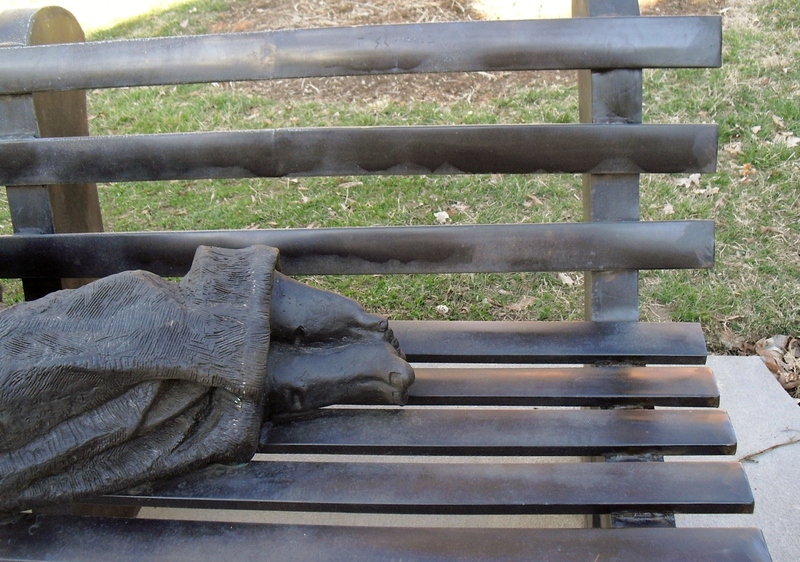 I’d much rather have a sculpture meant for the bench than a live homeless person. Great post, Sue. Sue – I follow the numbers on a weekly basis and yes, unfortunately the numbers are accurate. To add insult to injury, most of the men haven’t kept up with maintaining their yearly check-in requirements with the VA and once they reach 65, veterans are told more often than not, to use Medicare. Again, that’s another road block. The vets haven’t filed taxes, haven’t collected their disability checks from the VA or signed in for Social Security. There are around 500 women the VA knows about in the same situation. My thought is that either the women can’t last on the street as long as men or hopefully someone has taken them in that honestly cares about their welfare. Art, any art I s doing it’s job if it sets tongues wagging. By stimulating discussion, people are forced to think, and hopefully they expand their views.